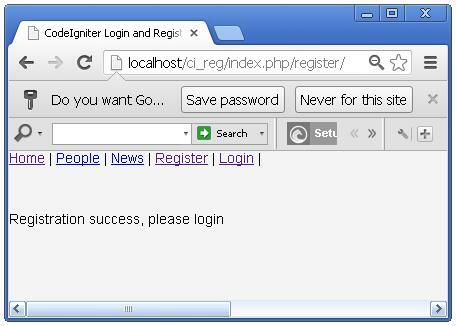 In this tutorial, I will explain you Full Featured user login and registration System with CodeIgniter 2.x. 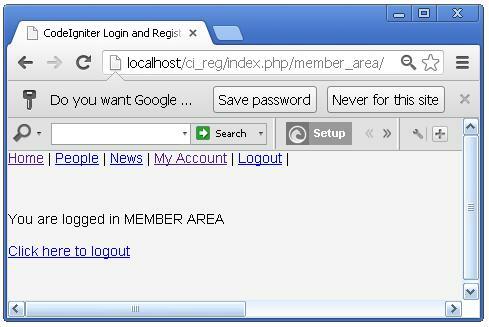 While developing a Web application, you should need a login and registration system as the bare minimum for security. 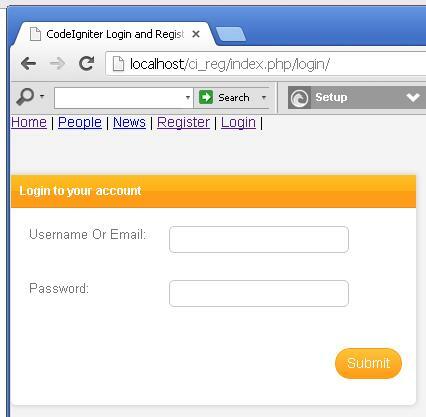 In this article, I explain how you can develop a user login authentication and user Registration system using the CodeIgniter framework. I am assuming that you know the basic file / folder structure of the CodeIgniter framework. 2. Create Two folder css and images/captcha within you Project folder. The css folder store your style.css file and images/captcha folder store captcha images. Make sure, it matches with your database. We will learn about showing data from database in CodeIgniter. But, before that, we prepare a database for practice. This post creates a database named “ci_reg” and a table named “users”. We use phpMyAdmin for easy. Enter database name “ci_reg” in create new database field. Click Create button. Your database will be created. Customize your welcome.php controller file (application -> controller), in the document Replace the following code. This above code and in constructor method we load CodeIgniter session library and load ci_auth and ci_menu model the ci_auth and ci_menu models we will create latter. Now, we begin create a model for showing menus and checking login status if $this->CI_auth->check_logged() == true? Then we show only $menu_logged array menus otherwise we show $menu_unlogged menus. // select data from database to check user exist or not? This above code genRndDgt function Generate Random Digit for create salt and genRndSalt create salt using genRndDgt function. The last function encryptUserPwd encrypt user given password. 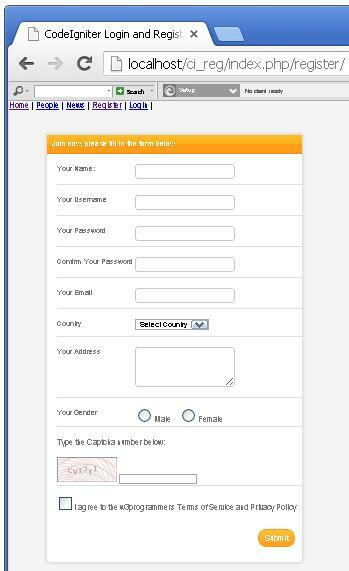 We need some css code to design our registration form. Copy following code and paste your css>style.css. This above code we load captcha helper for generating captcha image. The CAPTCHA Helper file contains functions that assist in creating CAPTCHA images. 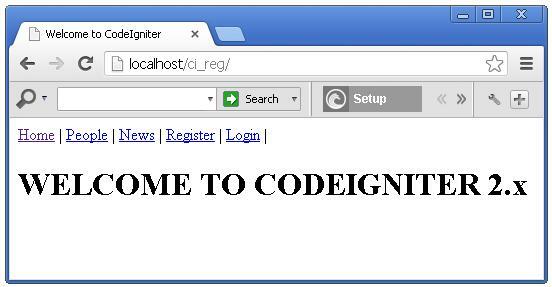 For more details you can see CodeIgniter captcha documentation. In this view we echo our validation errors like below. In our input fields, we use the below functions. set_value(), set_select(), set_radio() and set_checkbox() functions, for showing captcha we also use $cap_img variable that we already set in our register controller. Because of above function the original data will be show in the form, if there is an error after the validation rules. So we have only been dealing with errors. In the construct() function, firstly we load the form_validation library. In index function if($this->CI_auth->check_logged()=== true) this means the user have already logged in. So we will go to our member area. Else we will show registration from view. And then we set the rules for our form field. This above in __construct function first we add our session library and others models and helpers. Then in index function first we check the user already logged or not, if the user already logged in we redirect to our members area, otherwise we validate, sanitize and filter input fields data. So we come to the end of our Full Featured Login and Registration System with CodeIgniter and hope you all understand properly. Hello, Your tutorial is very good. Do you tell me How to use that on my web hosting server? After looking at a handful of the blog posts on your blog, I really appreciate your technique of writing a blog. I bookmarked it to my bookmark site list and will be checking back in the near future. Please visit my web site too and let me know what you think. Hi there to all, as I am actually keen of reading this website’s post to be updated regularly. It includes nice stuff. Thanks for this tutorial. 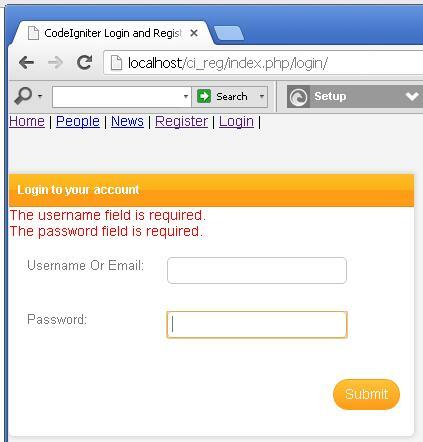 Please give me a suggestion, how to create multiple user registration from in a single registration form by using CodeIgniter. Great web site you have got here.. It’s hard to find excellent writing like yours nowadays. I seriously appreciate individuals like you! Take care!! Hi, yes this piece of writing is really pleasant and I have learned lot of things from it concerning blogging. thanks. I get this error… how to fix this? Hi Masud, great example, can you help with forgot password function? I followed your steps and I am having an issue with menu top, menu top is just showing separators but no links. Hi, I modified _links.php by this code, for getting the output you show to us, please let me know if this is the best way according to your tutorial. hi,where should i put the source code? i use xampp..
Great! tutorials. It works properly. Thanks Boss! Is file name like thse same as your documenet or changes some thing.. like “_join_form.php”? hai masud..i like your article about CI..many resources i found but this one i like it very much because easy to understand… after setting all this..i got this problem.. could you help me to resolve this? Dear Masud, thank you and respect for this awesome share. I got partially working your code on my webserver anyway I can’t get fully working because of I can’t download the source files, link broken. Can you please email me the source code..it will be very helpfull!! Great tutorial. Can you share the code I couldn’t find it. I have successfully implemented your tutorial and its working thank you for that. I have few doubts, how to add forgot password link and i want add two user roles while registration, based on user role i want to redirect to different page. Hi, I like your tutorial very much but my concern is the menu is not showing. can you provide help I use WAMP as a server. 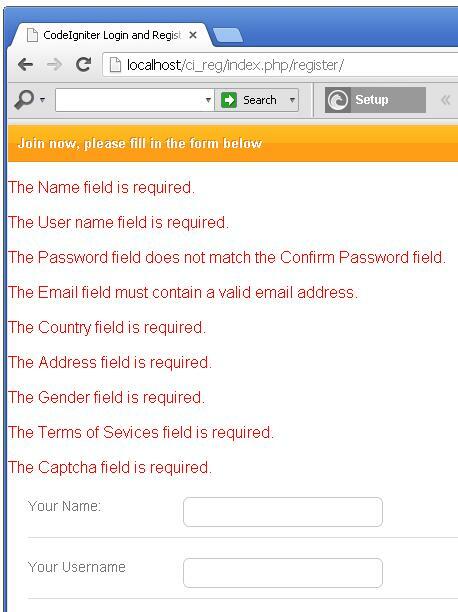 just modify the _join_form.php.you can get it right. Could you please give me the download source code, link directs me to 404 not found page . this is the best I’ve seen. Thank you. there are lots of friends having menu and css problem . please help them to getting out form it. I got the perfect code.anyone needs email me. i have problem with menu not shown. Has anyonme a link to the source code ,the link above seems to be dead. “The file you’re looking for has been moved or deleted. Please update your post with working download link. The tutorial was awesome but i have a little problem. When I try to register the captcha does not display in the form. Plus when I try to download the source code from drop box I get a 404. Can anyone help? how can i insert and update in a single page using codeigniter? i can’t download this source code..its showing 404 error. Superb, what a web site it is! This website gives useful information to us, keep it up.